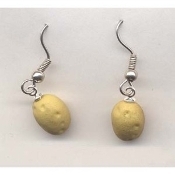 Mini Realistic Baked POTATO SPUDS EARRINGS - Tiny Idaho Taters Garden Tubers Mini 3-d Potatoes Spuds Jewelry - Teeny TATERS. Feel like you're really a COUCH POTATO ??? A must have for all DEVO and Ohio fans! Miniature rubbery plastic charms. Approx. 1/2" Diameter.